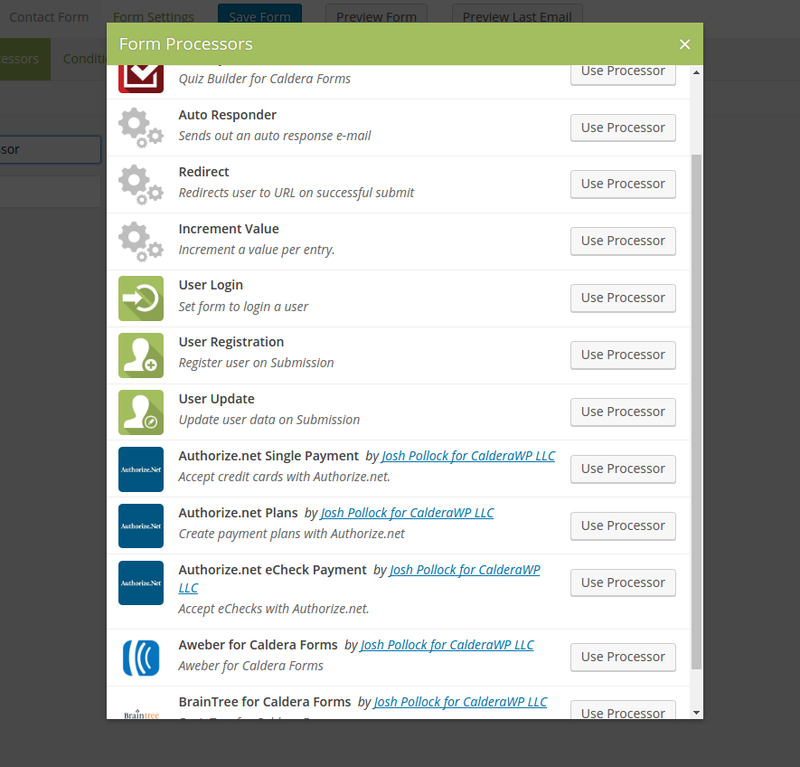 The Caldera Forms auto-responder processor is included in Caldera Forms core. 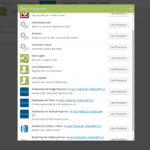 It can be used to send one or more emails when a form is submitted. It can be used in combination with the main Email Notification. The email notification, setup under the Email Tab is designed to be used to notify the site owner of the form submission and the auto-responder processor, which is added under the Processors Tab is designed to send emails to the person filling out the tab. You may choose, based on your needs, to use these two features of Caldera Forms in the reverse way, or in some other way. 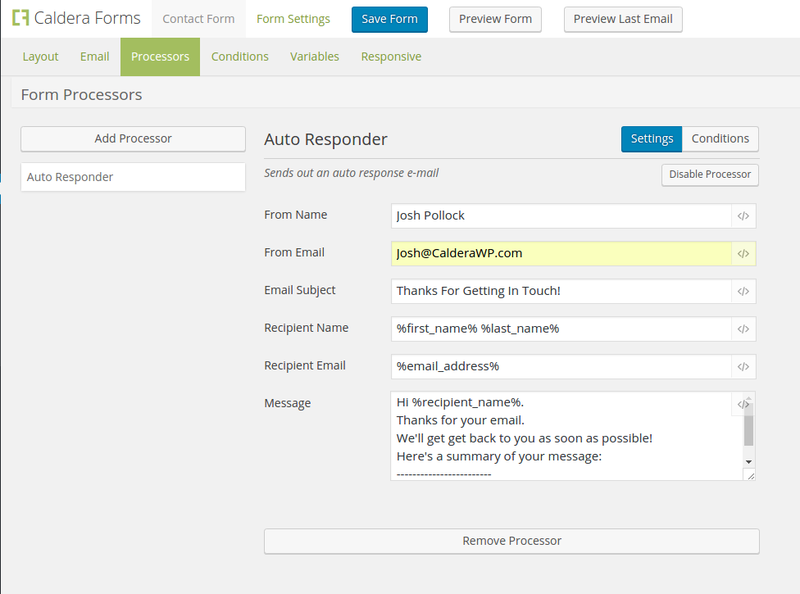 While forms only have one email notification, they can have as many auto-responder processors as possible. This means that if you require multiple emails to be sent to different recipients with different messages, the auto-responder processor is a great tool. In addition, if you would like to conditionally change who the recipents of the email is the auto-responder is a great tool, since it has conditional logic and you can add as many as you need, choosing which one will run using conditional logic based on form input. To add a auto-repsonder processor to your form, go to the Processors Tab in the form editor. Then click the Add Processor button. This will open a modal that lists all installed processors. 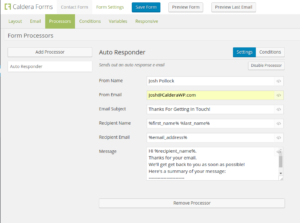 Select the Auto Responder processor. From Name The name of the person or company that the email will appear to have been sent from. From Email The email address of the name or company the email will appear to have been set from. If this field is left empty, the site’s admin email address will be used. Reply To Email The email for replies to this email.This will allow the email to be replied directly to the sender. Keep in mind that each of these fields can be set with a hardcoded value or the value of a submitted form field using Caldera Forms magic tags.